Do you have a fat Chihuahua? Are you worried about his weight or how to help him slim down. On average, a healthy Chihuahua stands around six to nine inches tall, weighing no more than seven pounds. However, some can grow taller and bigger. The Chihuahua has a small framed body with large round eyes, erect ears, and a rounded skull. When your Chihuahua is at an average or healthy weight, you should be able to feel their ribs easily. They shouldn’t have any bad breath or breathing issues. If they do, then this could be signs of illness. Other signs of a healthy Chihuahua include healthy joints and a thin layer of fat surrounding their body. If you can feel their spine and they don’t have an excess amount of fat around their tail, this indicates that they aren’t overweight. Lastly, you should be able to see your Chihuahua’s waistline just behind the ribs. The area behind their ribs should be visibly smaller than their chest. We have more information below regarding the weight and health of the Chihuahua. Do Chihuahuas Get Fat Easily? 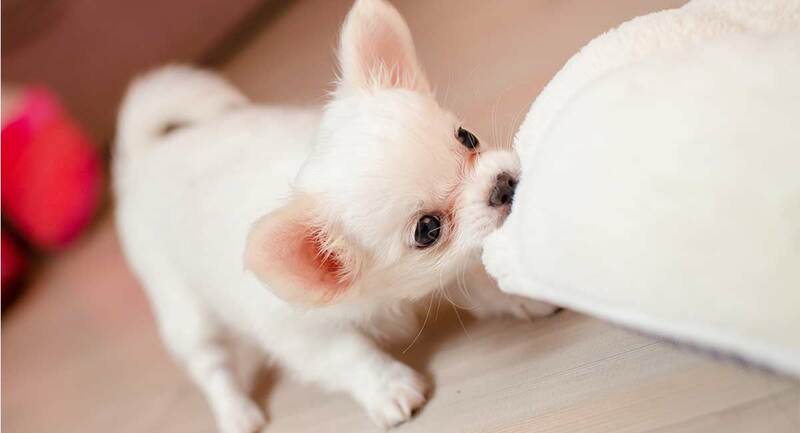 Chihuahuas are so small that it is easy for them to gain weight. This is especially easy when you give them treats when they beg. It doesn’t take too many treats to make them overweight. If you carry them around and don’t let them walk on their own, then that could lead to fast weight gain. Type of food has a significant impact on their weight gain as well. If you are feeding them table food or any food that isn’t theirs, then you can expect a fat Chihuahua shortly. 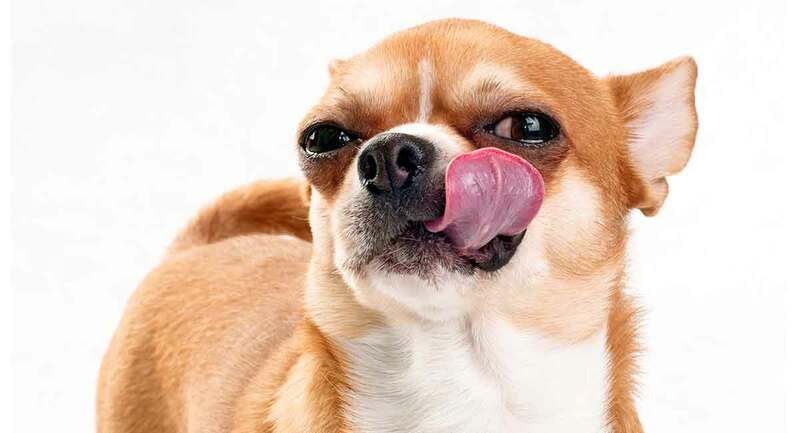 The Chihuahua’s digestive system wasn’t designed to process much human food. There are a few ways to tell if your Chihuahua is fat. First, examine your dog’s abdomen. Look and see if they have an abdomen tuck. If they do not, then they are overweight. Second, touch your dog’s shoulders, spine, and hips. If your dog is fat, then you will find it difficult to feel their bones, due to thick fat being stored around the bones. Last, identify your dog’s waist. Dogs, like people, should have a waist. Stand above your dog and look down at them. If they have a waist, the body will be slightly smaller from the back of their rib cage to the hips. Breed standards for the Chihuahua do not generally specify a height, only weight and description of their overall proportions. Both British and American breed standards state that the Chihuahua must not exceed more than 5.9 pounds. However, the British standard also states that the weight of four to six pounds is preferred. Pet Chihuahuas often range above these weights. They may even clock in above ten pounds if they have large bone structures or are allowed to become overweight. This does not mean they are not purebred Chihuahuas. Chihuahuas are a small breed. This means that they do not need much food throughout the day to feel full and be healthy. If you are feeding them more than a couple of times daily, then they will rapidly blow up in size. Obesity in anyone, even animals, opens a whole new world of numerous health issues that put well-being at risk. Excessive weight in a Chihuahua puts a lot of stress on its joints and bones. This in turn can cause arthritis at an early age. Obesity significantly increases their risk of Type II Diabetes (mellitus). This can mean that their body needs more insulin. In some cases, your Chihuahua could need insulin on a daily basis. If not treated properly, they could go into shock. Back and spinal problems are another severe problem that can occur from being overweight. When they become obese, this puts a lot of stress on joints and sensitive areas. Obese Chihuahuas are at risk of developing high blood pressure (hypertension). This is as dangerous as it sounds. High blood pressure puts stress on the organs and tissue inside their body, which increases their chance of organ failure. One of the most severe and dangerous ailments that come from obesity in the Chihuahua is heart disease. The extra fat inside their body forces their heart to pump extra blood. This, combined with the extra pressure placed on the organs, makes them at high risk of heart disease. Helping your Chihuahua lose weight can take some preparation and time. This can be discouraging and somewhat difficult, but it’s not impossible. We are here to help you through your dog’s weight loss journey. Firstly, cut out treats. It can be hard sometimes to not indulge them. However, this is where most of the weight your dog is gaining comes from. All the treats you give them add up quickly and will pack on the unwanted pounds. A smart choice would be to cut out treats all together until they get to a healthier weight. Secondly, swap training treats for healthier alternatives. You may not know how many calories you are feeding your dog in treats. Typically, treats are very high in sugar, fats, and calories. Those are the three things you do not want. Instead, look for other alternatives to feed them like turkey bacon or chicken breast. Turkey bacon and chicken breast are high in protein and low in fat with no sugar. Cut it into small pieces and feed only when rewarding good behavior. Thirdly, reduce quantities at meal times. Reduce how much they eat gradually over time, not all at once. Cutting too much food at one time will make their body go into survival mode. When their body is in survival mode, the body will hold onto fat, which is counterproductive. Instead, when you gradually decrease their meal sizes, their body will boost their metabolism, and their stomach will shrink. Once you decrease their meal sizes over time, weigh your dog to check progress. If they haven’t lost as much weight as you would like, then keep minimizing meal sizes until they achieve the desired weight. You can also increase your dog’s exercise output to increase their weight loss. However, this should be combined with healthier feeding habits. The best way to care for an overweight and unhealthy Chihuahua is to give them the proper amount of exercise they require. This is possibly the most crucial step to keep them healthy and helping them lose weight. Exercise not only helps them lose weight and feel better, but it also increases their lifespan. Other benefits of proper exercise include less chewing, barking, digging, whining, and rough play. When you discover a good exercise program and get your dog on it for a little while, you will see dramatic improvements in their health and mood. This includes reduced depression, less anxiety, and steady weight loss. If you would like to share your pets weight loss journey, comment below! Hargis AM “Relationship of hypothyroidism to diabetes mellitus, renal amyloidosis, and thrombosis in purebred beagles.” Life-sciences literature, 1981. David A. Andersen “Low calorie pet treat” Abstract, 1988. Giuseppe PICCIONE “Effect of Moderate Treadmill Exercise on Some Physiological Parameters in Untrained Beagle Dogs” Experimental Animals, 2012. Junfu Mao “Prevalence and risk factors for canine obesity surveyed in veterinary practices in Beijing, China” Preventive Veterinary Medicine, 2013. Alexander J. German “The Growing Problem of Obesity in Dogs and Cats” The Journal of Nutrition, 2006.